The road to tawang will make anyone realize that the journey is sometimes more important that the destination itself. The ideal choice of a backpacker to reach tawang is to take a shared sumo service from Tezpur which cost us about Rs.750/ per person. Luxurious travelers with deeper pockets can choose to avail a SUV from Tezpur. Do ensure you have necessary permits to enter Arunachal Pradesh before you onboard. The shared sumo normally has about 10 passengers and a driver, 2 in front + driver, 4 in the middle and 4 at the back and all the luggage go on top. If you can believe we even had 4 adults in the front when we were coming back. Needless to say, the seats in the front are the most convenient and coveted. The seat numbers are allotted at the time of purchase of tickets itself and there is no discretionary pricing between the seats. The luggage on top are neatly covered with rain proof tarpaulin sheets and stay there for rest of the journey. So keep your day pack with your wallet, water and whatever else you think you may need in your 14 hour journey to Tawang. There were only three scheduled breaks, for breakfast, lunch and dinner and the bathroom breaks to be accommodated in that 20 mins break. With all that prep, let us get to the journey itself. The road trip to Tawang is one of the most popular and rewarding road trips one can take. Tezpur-Bhalukpong-Bomdila-Tawang Tourist Circuit covers a total of 350 Km and can be a 14 hour long day journey if you want it that way. But it is more rewarding to break it up into parts and enjoy these beautiful places. It might be ideally a 7 day trip if you wish to do a relaxed multiple break journeys in your own bike or car. For passionate bikers this is a most coveted road, and can also be covered over a period of two days with interim halts in one of the bigger cities mentioned below. This is one of the most beautiful and well-kept cities of Assam with neatly laid out parks. The roads are beautiful, long and quite picturesque and is only a few hours drive from the city of Guwahati. Right after we set out off the city and even before we hit the ghat roads, we were surrounded by greenery and spellbinding beauty. Almost all houses had beautiful variety of flora and fauna and small ponds. Bhalukpong is the entry point of Arunachal where all the entry permits are checked. Indians are required to have Inner Line permits and Foreign Nationals should have Restricted Area Permits before they get here to be allowed inside Arunachal. The permits are issued in multiple cities including tezpur and can be obtained within a day on any weekday. Bhalukpong is about 56 Kms from Tezpur and is at 213 Mtrs sea level. The place is famous for archaeological ruins of King Bhaluka who was the grandfather of King Bana of Mahabharata fame and an ancient ruler of this region. A historical fort of 10th-12th Century AD is situated in the foothills of the region and one can see the stone remains of the fort. Some important remains of King Bahluk’s capital and his grandson Bana are preserved here. The Kameng River that flows here is a beautiful picnic spot as well as gives scope for adventure sports. Since this is only a day trip from Assam, a number of Assamese families frequent this place often. It is 5 kms from Bhalukpong and is famous for its orchid museum where one can see about 450 species of orchids. Some of these are rare and endangered. It is 24 kms from Tipi on the way to Bomdila. There is a natural orchid sanctuary spread over 10 sq km. More than 2600 orchids representing 80 species have been cultivated in natural surroundings. With so many beautiful orchids growing in the backyards on the way, I’m sure Tipi and Sessa is a must for those who’d enjoy it. Bomdila is a beautiful pass at about 8000ft above Sea Level and around 109 km from Bhalukpong and is the headquarters of West Kameng District. The place is inhabited by tribes like Aka (Hrusso), Miji (Sajalong), Monpa, Sherdukpen, and Bogun (Khawas). One can also watch various snow clad mountain peaks from Bomdila including the Kangto and Gorichen Peaks which are the highest peak of the state. Bomdila is well known for its monastery and has an unmistaken Buddhist touch, where almost all public buildings like markets and other strctures have strong Buddhist influence. Bomdila also has a craft centre and shopping centre which would give one a feel of the local version of Himalayan Buddhist life. Dirang is a beautiful valley at 4900 ft above Sea Level and is at 42 kms from Bomdila. Due to the lower altitude Dirang has generally warm cozy and pleasant climate compared to Bomdila or Tawang. Dirang provides a picturesque view of and also access to the Kameng River. The place is famous for hot water springs and it is believed that a bath here can cure skin ailments. Places worth visiting here are the apple and kiwi orchards, National Yak Research and Breeding Center at Nigmadung, Sheep Breeding Farm and the Sangti Valley where Siberian black necked storks visit during winter. Dirang Dzong or Fort established in 17th century at Dirang Basti is located at a scenic hill top and requires one to travel some distance in the town. Dirang also has a couple of tibetean buddhist monasteries worth a visit. Sela pass at 14000 ft above Sea level is 45 kms from Dirang on the way to Tawang and an absolute treat to the eyes and senses. 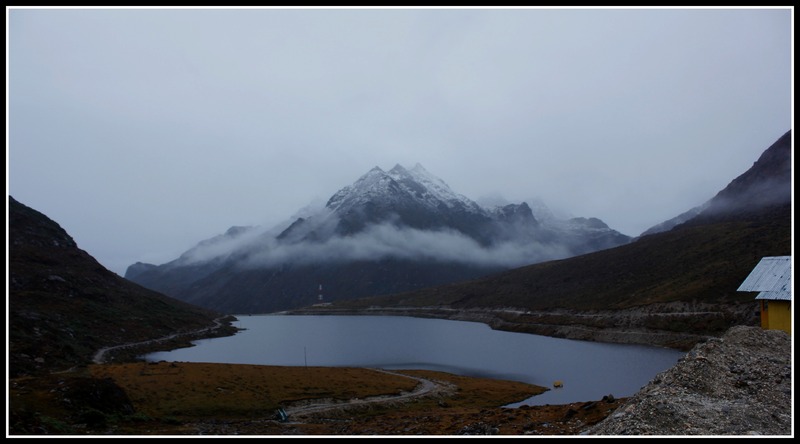 Sela Pass is the world’s second highest motorable pass at an altitude of 14000 ft. The serene crystal blue water natural lake and the surrounding landscape of ice capped peaks is quite breath taking that it still takes my breath away to think of this place. If you are lucky, you may be able to see the undisturbed reflection of the ice capped peak on the serene lake, and I bet it’s a scene you will never forget in your life. It was indeed a picture like this that made us decide tawang is going to be our destination without a doubt. The roads at this place gave me a feel that we were indeed on top of the world. These roads can get very challenging in the winter months with both snow and extreme temperatures. Any undue snowfall may severely delay or even hamper your plans to reach Tawang. As this is used widely by the army it will be eventually cleared, but head to the nearest army outpost if you get stranded and are in search for shelter and do provide for any delay enroute during these times. As in any other small towns with arterial roads, you will probably get to hear about this much earlier than you get there at the pass. Just keep an eye out and keep asking. It is 12 kms from Sela Pass, at 6000 ft above Sea Level. Nuarannang is famous for cold water snow and rainbow trout fish hatchery where one can go fishing in the chilly waters. 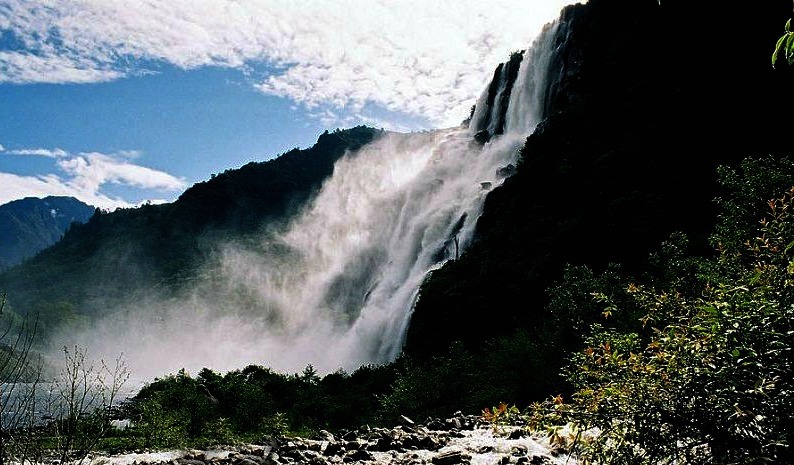 Nurannang is also famous for its beautiful water falls also called Jung Falls which was featured in Tanhai tanhai song in Koyal Movie. Jang falls is about 100 mtrs high and the sound can be heard from far. A small route deviation of about a Km or so can take one near the falls. Nurannang River originates from the northern slopes of Sela pass and forms this breathtakingly beautiful falls before it falls to form the tawang river. One can trek to the base falls where a hydel power plan is located. Jaswant Garh is located at a distance of 4 kms from Nuranang, Jaswant Garh is a memorial erected in the memory of Veer Jaswant Singh of the 4th Garhwal Rifles and a recipient of Mahavir Chakra (Posthumous) who stopped the Chinese Army for nearly 72 hours during the 1962 aggression. The War Memorial near Tawang also has stories of bravery of the army during the 1962 Indo China war and features some of the war equipments used by Indian army during the war, bullet laden artifacts and some pictures from the war time. Infact it said that Nurannang got its name for a local lady who helped Jaswant Singh accomplish this arduous task. And then you will reach this beauty called Tawang at 10,000 ft above sea level. If the journey has been so rich and rewarding from culture, nature and historic perspectives, what does Tawang hold…May be that should wait for another day and another post. Until then enjoy your journeys b’cos it might be more rewarding than the destination itself. If you take the Sumo, it is necessary to book the trip at least a day prior in one of the many Cab offices in the Tezpur City. Although seats are allotted on a first come first served basis, we managed to request to get our seats moved to the friend in the cab office although we were probably the last to book the cab that day before they shut down. Since most other travelers in the cab were frequent vistor on business may be they didn’t mind having two over enthusiastic travelers in front. The Cab picks you up from your hotel, so you need to provide the hotel address in the cab office and since you would be leaving as early as 5, it is advisable to finish all exit formalities on the prior day itself. Carry snacks and water in your day pack but limit its intake due to limited breaks. Of course this rule does not apply if you are traveling on your own vehicle at your own pace. We had managed to create a good rapport with our driver and were rewarded with a few 2 min breaks for photo ops at scenic places like Sela pass and some of the numerous falls, you will find around. Drivers are friendly and honor such requests from friendly tourists but do not overuse or abuse the privileges. A 5AM pickup is a 5AM Pickup and a 20 min break is a 20 min break and does not fall into the Indian Stretchable Time standards. It’s a long journey and is important to keep up the times given. The 14 hours’ time journey denoted here applies only in the best of circumstances; winter journeys can be painfully much longer.